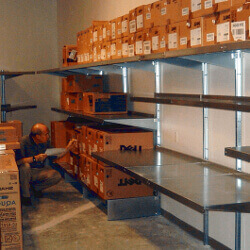 Since 1945 E-Z Shelving has manufactured the finest, heavy-duty metal shelving systems available. E-Z’s cantilever shelving design is durable, efficient and fully-adjustable. Its aesthetic is simple and bold, and prized by the country’s top architecture and design firms. "The shelving is strong, and the lines of the system are simple enough that they visually take a back seat to items that populate each shelf." See E-Z's latest mention in "4 Rules for a More Minimalist Home" on GQ.com. 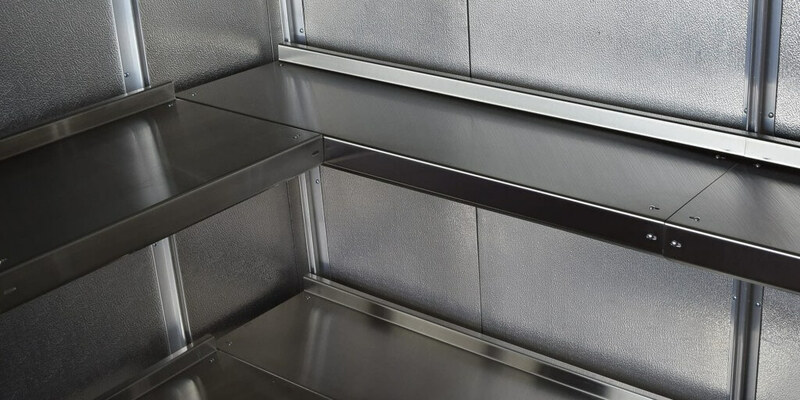 Whether you’re seeking a basic storage solution, or a custom shelving system that meets specific requirements, a call to E-Z Shelving will put you in touch with a shelving specialist who knows how to help you. We'll work with you to configure the ideal shelving system, build it for you in our American plant, deliver on-time, and support you through installation and beyond. On a tight schedule? Contact us about rush orders. 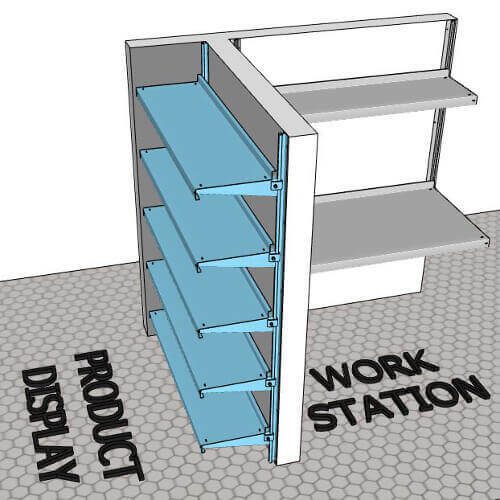 Product Overview How to Get Started What can you do with E-Z Shelving? What can you do with E-Z Shelving? Our shelving systems are industrial-strength. Many customers are astonished at rock-solid feel of the shelves without front support posts. It's a time-tested design that we've used for heavy metal storage in our own plant, without a failure, for over 40 years. So go ahead and request a quote for storage of ammunition, coins, and other high-density items. 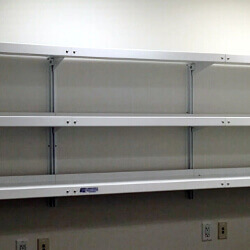 We'll ship you a heavy-duty shelving system that's ready to install, and ready for heavy loading. E-Z's shelf tiers are easy to adjust, easy to level, and ready for placement at precise heights to help you get the most out of your space. Our support posts reside behind your shelf items. 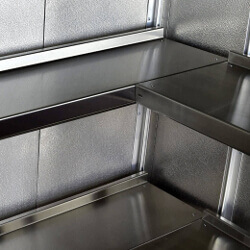 Our metal shelves feature multiple flanges for extra rigidity. The result is a clean presentation of your items along horizontal shelf lines, even on a long wall. 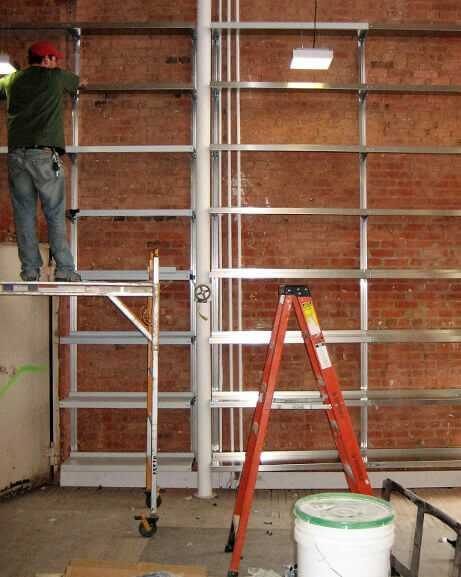 E-Z's system design allows for building over wall elements up to 1 ½" thick, and building around anything else. When you find yourself in a tight spot with awkward room dimensions, or last-minute design changes, don't worry. Your E-Z Shelving specialist will be ready to make it work. You may be working with limited space, or trying to acheive a balanced look. 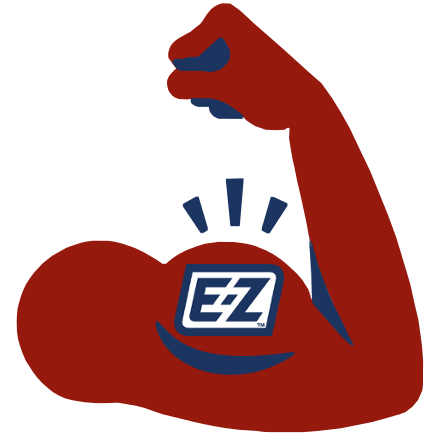 Whatever your challenge, E-Z will provide you with the custom shelf dimensions you need to succeed. We provide metal shelf lengths to the 1/16th of an inch in more than a dozen different depths. The only hard part about using E-Z for your library shelving is deciding on the finish. Will you go with an industrial look of galvanized shelves over brick? The warmer feel of aluminum? The modern brilliance of stainless steel? Or will you pull the space forward with a unique, custom color? Whatever you choose, the result will be timeless and clean, adapting as your media collections change over time. 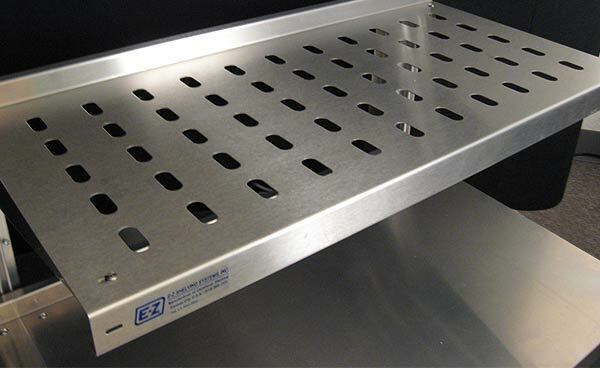 Whether your work surface is a desktop, a prep table, or a shop table, with E-Z Shelving you can set it to the perfect height for comfortable production. Do a standing desk, a sitting desk, or both, all with a ton of storage and easy integration of lighting and other fixtures. 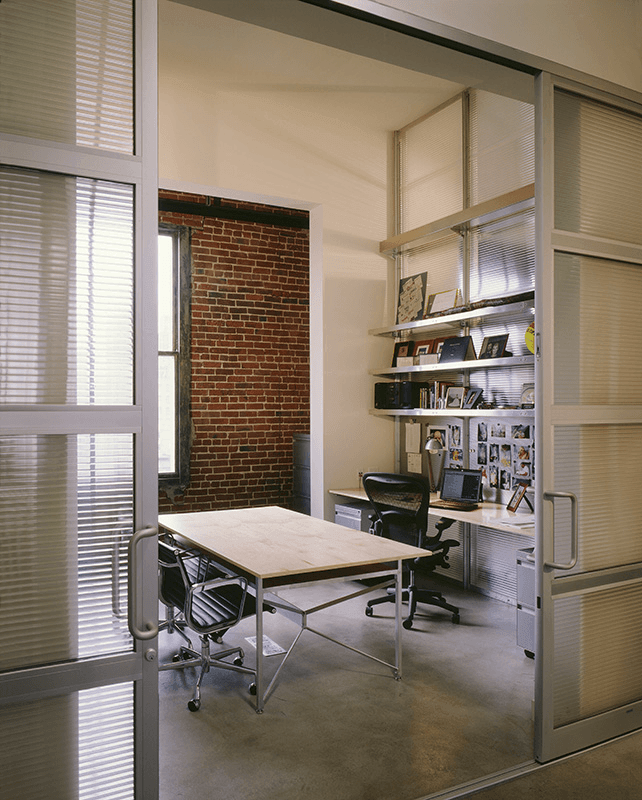 Design a single or multi-wall partition, adding E-Z shelf depths that fit the purpose of each space. Or send us the dimensions and let us design it for you with our freestanding uprights. Present your prized products along clean, classic metal shelf lines. 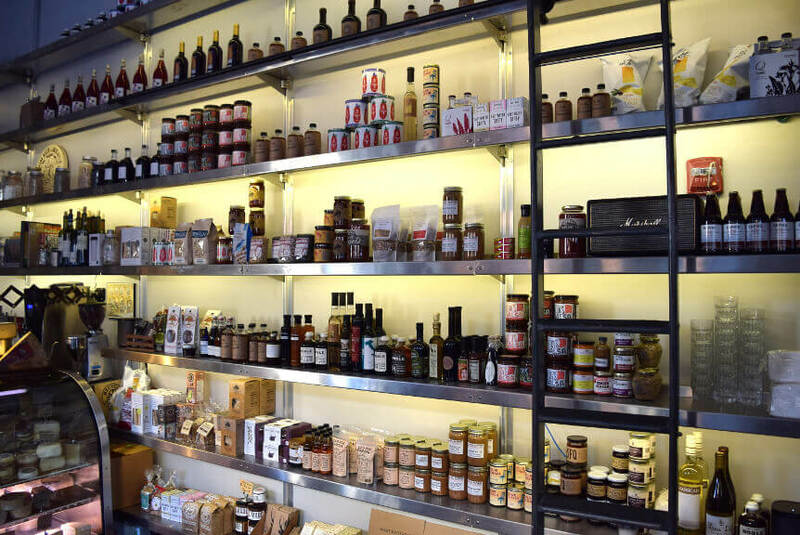 Stagger shelves in vertical displays. Add garment rods and make clothing pop over a brilliant, white powder coat finish. Mount shelves to window frames to catch eyes from two sides. Our shelving is industrial strength, but it's ready for retail. E-Z Shelving's louvered shelves are often employed to increase air flow around a product, or to allow for the passage of cabling, but they're just as often used for the aesthetic. Like our other shelf products they're available in over a dozen different depths and lengths to the 1/16th of an inch. 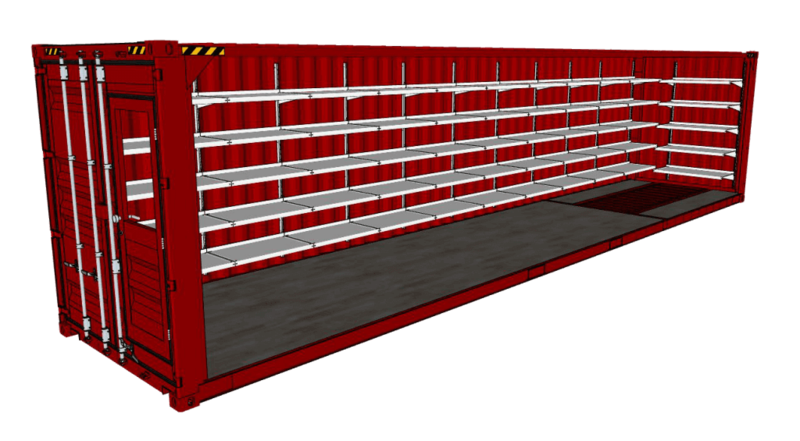 We've built shelving for just about every type of application, including box trucks and, yes, shipping containers. 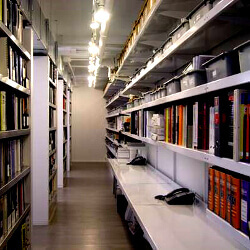 Our shelving system is extremely versatile and our experts know how to help. So go ahead and contact us at (800) 353-1331, or make your request on our quote form. We look forward to working with you. Check any that describe your shelving project.